Speed and Strength, known best for their high octane attitude and their highly versatile lineup which has something for everyone, has filled a much needed gap in their helmet arsenal. 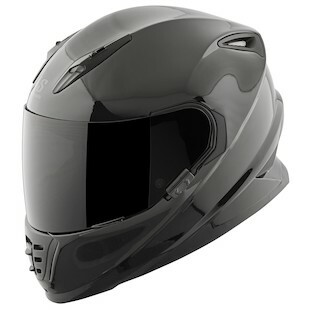 The new Speed and Strength SS1310 Helmet comes in at the $149-$169 price point. This new SS1310 offers the same aggressive styling, shape, internal fit, construction, liner and ventilation as the tried and true SS1600, but at a more friendly price point. All you lose with the SS1310 is the drop down internal sun visor and the ECE rating, as Speed and strength has elected not to have this new helmet ECE tested. The solid color SS1310 will be offered in attractive gloss black and a matte black options, both of which come with minimal branding on the forehead and a nice $149.95 price tag. The Speed and Strength SS1310 The Quick and The Dead Helmet comes in at $169.95 and has your typical Speed and Strength aggressive graphics and loud branding. The Quick and The Dead is offered in three colors; a sleeper black, a bright hi-viz yellow/white/black, and classical looking red/white/black. 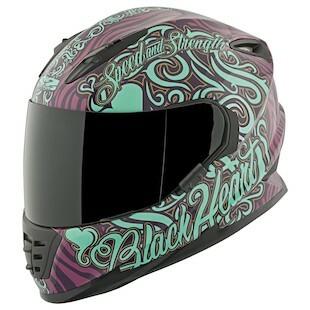 The Speed and Strength SS1310 Black Heart Helmet looks to be aimed towards the lady rider, with aggressive tribal and heart designs throughout. This lid is offered in a cool purple/teal, and understated black/grey, and an eye-catching red/yellow. Speed and Strength offers good looking and strong performing helmets that don’t break the bank. If you are in the market for a new, versatile and attractive lid for the upcoming season, the new SS1310 is worth a serious look.